The afterlife for an ex-ITV contractor is rarely long or prosperous. The first to go was Wales (West and North) Television, falling into bankruptcy and being taken over by its neighbour TWW. They were next to go, famously losing their contract in 1967 and flouncing out of ITV in March 1968. They had many investments – from theatres to opticians – and were offered a 40% slice of their successor, but declined both the Harlech investment and continuing in business, selling themselves off and ceasing to exist before the decade was out. Next out were Westward and Southern. The Independent Broadcasting Authority saw to it that they exited quickly and quietly by requiring their successors, Television South West and Television South respectively, to buy the remains of the companies. Television South West was next to go, and it committed corporate suicide via a reverse takeover – a company in an unrelated business lent TSW the money to buy them, then took over their stock market listing and renamed TSW to their own name. Even this didn’t last, the company falling into administration some years later. Television South had famously over-extended itself by buying the American MTM Enterprises and was bought for a song by televangelist Pat Robertson; from there the company was sold to Fox and later Disney. Thames Television’s afterlife is well known. Its “Plan B” for the almost certain loss of its franchise was to convert to being an independent production company. After much shifting ownership, the name still survives as producer of The X-Factor, although the constituent parts of the original Thames, the studios at Teddington and Euston Road and so forth, have long been sold off separately. For ABC and Rediffusion, things are slightly different. While they were notionally “merged” to form Thames in 1968, in reality both companies did have something of an afterlife. ABC’s main afterlife was Thames itself – the company was clearly ABC under a new name. ABC’s parent, the Associated British Picture Corporation, would later be bought by EMI and turned into EMI Films. 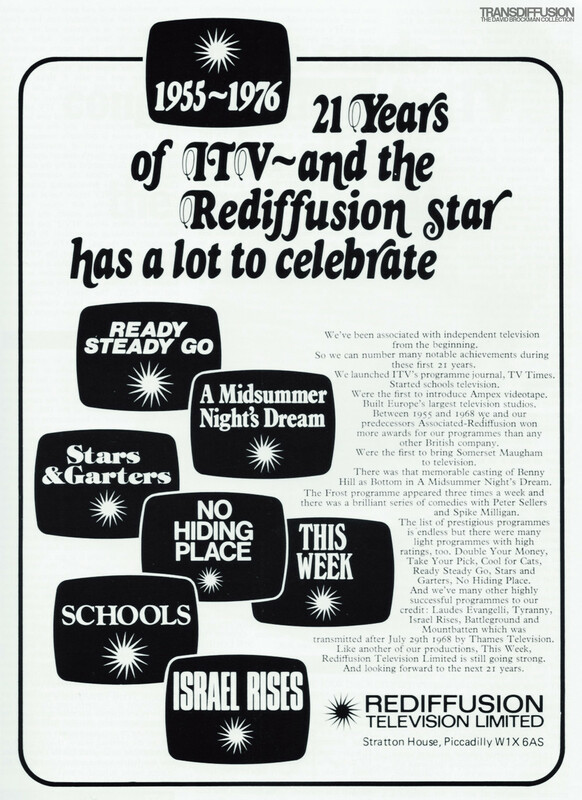 Rediffusion was a joint venture between British Electric Traction (BET) and BET’s subsidiary Broadcast Relay Services. The BET conglomerate was huge, with interests in laundries, construction companies, plant hire, printing, flight simulators, record publishing, waste disposal and washroom facilities. They saw no need to get out of the television business. With interests in wired broadcasting relay (early cable) and international broadcasting from Barbados to Hong Kong, they could continue to operate even without their UK outlet. One of the assets they held was a giant collection of film and early video programming. There was, at the time of this advert in 1976, thought to be no market for such black-and-white repeats. Nevertheless, Rediffusion Television Limited held on, ready and waiting for the chance to become a UK broadcaster again.